The Cadillac of all Honey started with Clyde Owen a lifelong minister, wonderful husband, great father of a daughter and three boys. Dad started with a few hives and worked his way to a considerable amount of colonies. Over the years he was successful beekeeper well known to others in the Florida panhandle and highly respected for his love for God his kindness,honesty ,trust and desire to help others. 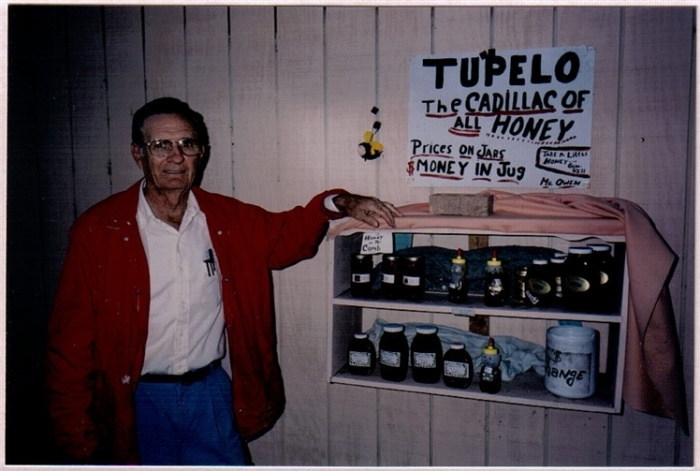 Knowing the uniqueness of the Tupelo Honey, he set up a drive thru stand at his house and started selling honey. He always said that back in the good old days when it came to a car everyone wanted a Cadillac because it was the best , well made and gave someone of a successful reputation . Applying this concept to his honey with its unique taste and not turning to sugar he coined it Tupelo Honey the Cadillac of all Honey . Not long would he be selling roadside stand to people traveling the scenic route of highway 98. Alot of people came to know dad while traveling highway 98 and knew where to stop to get Tupleo The Cadillac of all Honey. Dad always had a heart of giving to the work of the Lord in every aspect of his life. He was a man that had many qualities about him that you don't see much anymore. His integrity and dedication to the work of the lord was unmeasurable in many ways. Of course anything that he did or ever accomplished , he gave God the glory. He pastor-ed four churches and helped to build two, Lakewood Baptist Church which was one of the largest at the time. Central Baptist mission, all of which are still active today, and also pastor-ed Victory Baptist Church. Dad always considered selling honey as a ministry . On roadside giving out Gospel tracts and supporting Missionary's in other country's in many ways. Contributing to getting Bibles printed, so people from all over the world would have a Bible in there native tongue.
. Hello , My name is Matt Owen. I am the youngest of the 3 sons of Clyde Owen. I started this web site so people would get a better picture of what tupelo honey is, its history, and how fortunate we are to have and provide Tupelo honey. Also the convenience of buying online , But most of all, to carry out the mission that dad laid out many years ago, to continue to help in the Lords work around the world. I'm honored and thankful to be a part of this legacy. And you can be a part of this mission knowing that a portion of your proceeds goes to a great cause.